Includes on bargain Ben Franklin wig. 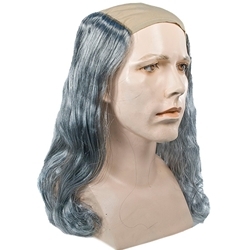 The wig features elastic band for a comfortable and secure fit to almost any head size and a fabric bald cap. Ben Franklin is a well-known American historical figure, best known for his inventions and his part as a founding father of the United States of America. This wig is styled after his looks in his older years. This wig is affordable and works perfectly for school projects and reports, historical costumes, or theatrical performances on a budget.